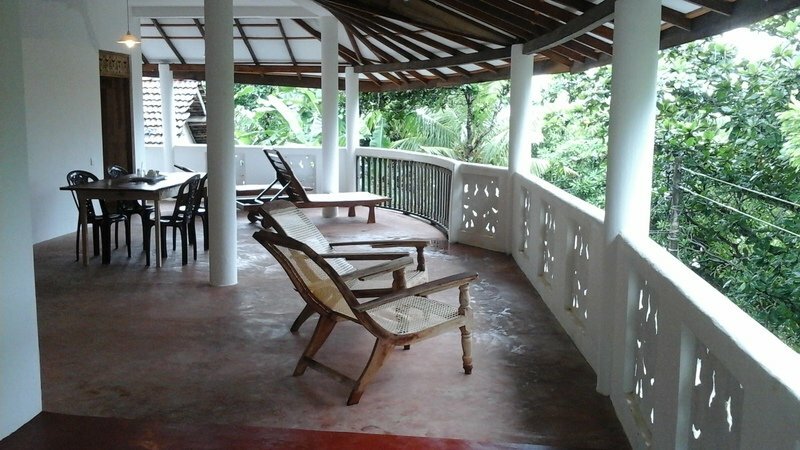 Ketature Beach House is a simple family run, surf-home-stay 25m from beautiful Ketature Beach, in south west Sri Lanka. The guest house is ideally suited to staycation surfers, couples, small groups and surf family’s. Three nights minimum stay, with many guests staying one month or more, chances are you won’t want to leave. 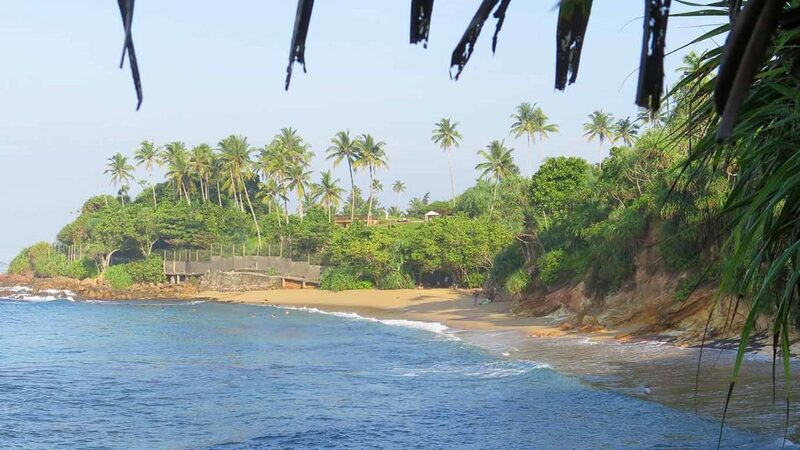 The road to Ketature Beach House is between Gurubebila village and Weligama Harbour and takes you far away from the noise and bustle of the main road and town. Surrounded by tropical forest and palm trees, it’s a perfect quiet hangout. Check the swell from an epic, south facing roof terrace before you head out to a great selection of beginner to intermediate surf breaks. Perfect also for sunrise and sunset yoga. 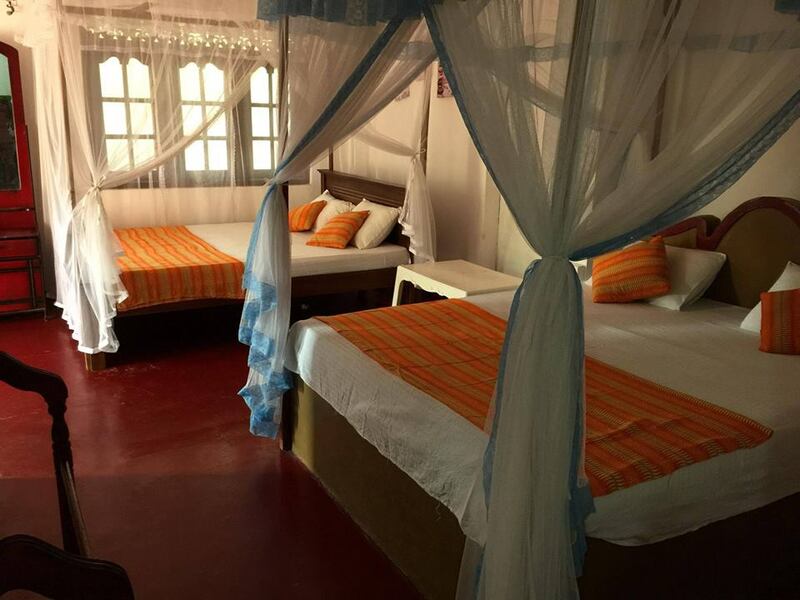 There are two double rooms, a two double bed large room and a first floor, two room family apartment. The guest house is open all year with peak times between Nov and Apr. 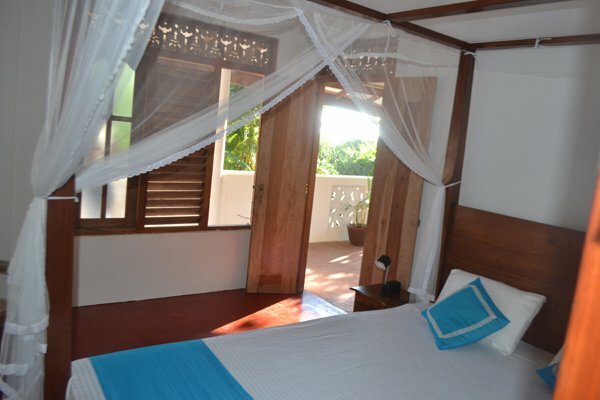 Rooms have ensuite bathrooms and celling fans, towels and four poster, mosquito nets. Please ask about small extra beds for children. Breakfast is included. A variety of continental and local breakfast different every day. Refreshing seasonal fruit and vegetable juices. Lavazza or local coffee and Dilmah teas. 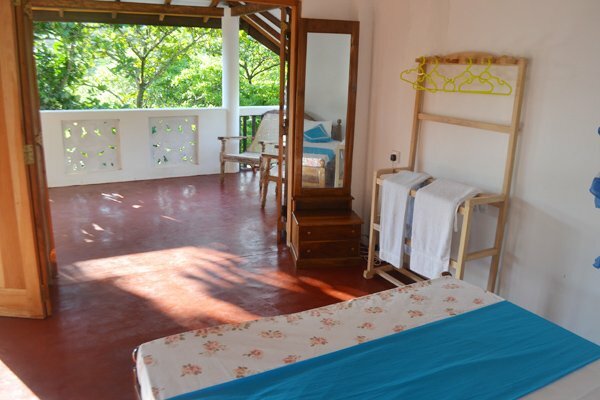 Prices are per night and in local Sri Lankan Rupees (LKR) and include breakfast. Please contact us for availability and booking. – Two large double beds. Small Double Room No1 – Double bed ideal for couple or solo long stay. Ketature Beach a great private swimming and snorkelling beach about 200m wide. From December to March the family run a daytime sea food restaurant and juice bar. Evenings are pre bookable for couples to large groups. Anything from grilled fish, prawns and cuttlefish, fresh salads, guacamole and ceviche. The Guest House kitchen also has a unique range of Sri Lankan rice and curries, seasonal vegetable, fish and chicken. Food is freshly prepared from natural ingredients so best to pre order a little earlier if you are a big group. On the right of the beach there is a lovely batik shop selling a range of light weight sarongs, dresses, shirts and souvenirs. Only a short walk further to Coconuts surf point. The main surf season in the south west of Sri Lanka is between October-April with Dec-Jan-Mar offering the best swells and minimum winds. On a good swell the shallow reef break becomes surfable at high tide. You are perfectly located to get to the next bays with some of the best waves in the region. Walking, you have a powerful left and right at Jungle Beach, Walliwala and a great rights at Coconuts and Plantation in Gurubebila. By Tuk Tuk or scooter, Weligama the beginners beach break is just 10 minutes west and you are 15 minutes east to Kabalana beach and classic A-Frame – The Rock. Rams, a barrelling right, Lazy Left and Devils Rock are popular Midigama – Ahngama surf breaks on the way. Dan on ‘Danagama Left’, Ketature Beach Surf Point. We stayed here for a week and absolutely loved it. Away from the hustle and bustle of most of the south coast tourist scene with an almost private swimming beach practically on the doorstep. Awesome location with great surfing breaks a short walk away. Decent food options nearby but the hosts are also good cooks and bring you coffee or tea in the morning, breakfast included, dinner (rice and curry, fish, pasta) if you request it. The best part is the wonderful Sri Lankan family that runs and lives at their guest house. They are absolute gems and made us feel so welcome, joyfully played with our kids, attended cheerfully to our every needs, negotiated local prices for rides and services, and made us fall in love with them. 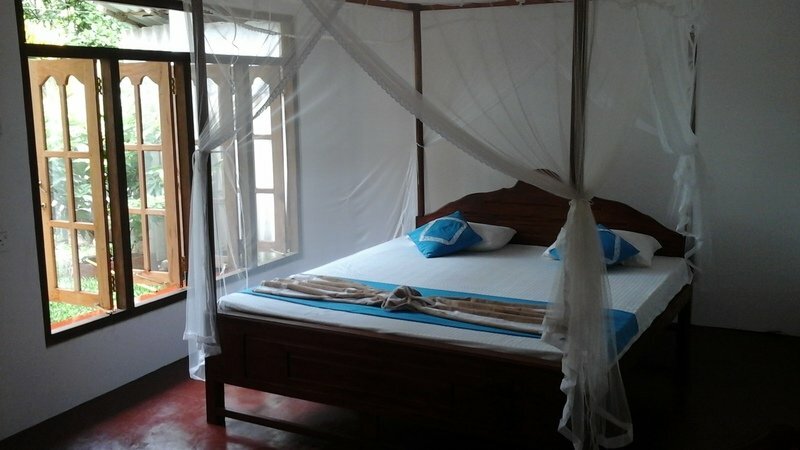 Ketature Beach House shared a 60 Seconds in Sri Lanka with Tuk Tuk Rentals. Ketature Beach House shared a photo.